B - Just as Oliver Hirschbiegel's uncommonly penetrating Nazi epic Downfall pivoted on Bruno Ganz' portrayal of Adolf Hitler, so too does his tale of the Irish Troubles' aftermath rests on the shoulders of an actor. 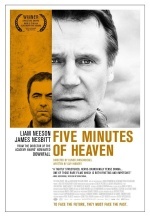 However, Five Minutes of Heaven's most riveting performance isn't delivered by its most familiar face, Liam Neeson, whose repentant Loyalist now works in conflict resolution. Leonine and haunted, Neeson suits the material well, but the film's locus is unequivocally James Nesbitt, as the brother of a Catholic man a seventeen-year-old Neeson gunned down. Goaded into confronting his brother's murderer by a company that engineers reconciliations for television, Nesbitt is wholly mesmerizing as a frayed man who is utterly unapologetic about his hatred and his lust for revenge. Hirschbiegel and writer Guy Hibbert never lose sight of the story's essential theme of the futility of blood-for-blood, but they are unafraid of exploring other avenues, such as the insidious nature of indoctrination, the toxic effects of grief on families, and, most damningly, the manner in which the media exploits human tragedy and treats peacemaking as just another bit of niche programming. It's primarily some third act wheel-spinning and narrative goofiness that prevents the film from feeling like an unqualified success.